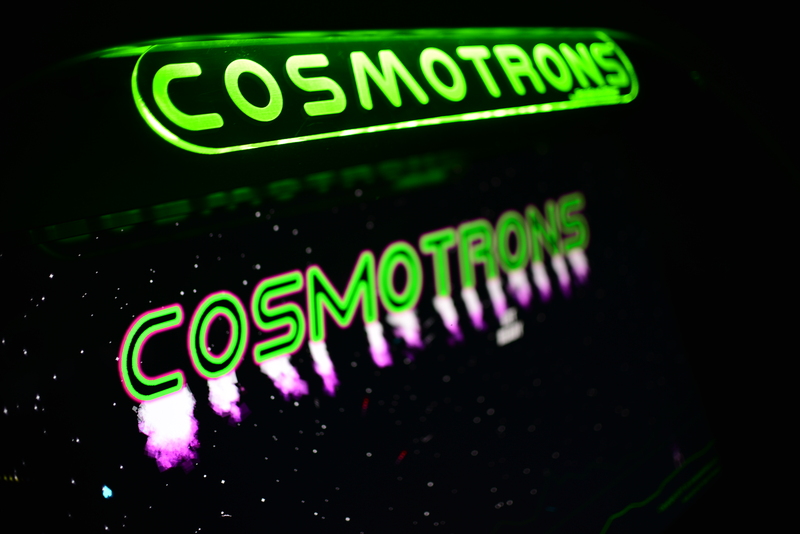 Cosmotrons – Don’t let gravity bring you down! Which nation will you fly for? 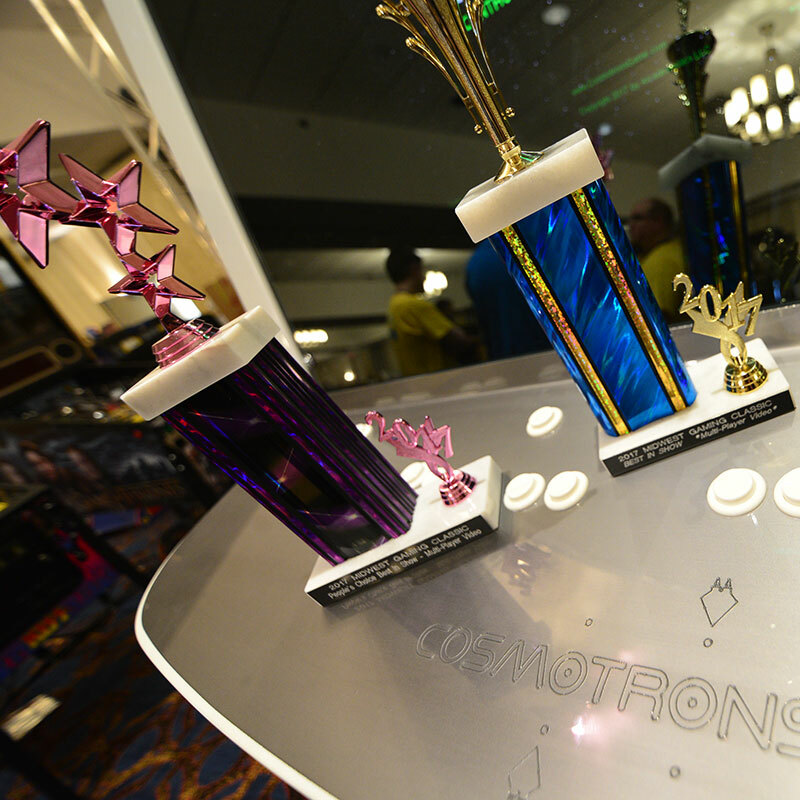 What spaceship model will you pilot? Where in the galaxy will you vote to engage in battle for precious fuel resources? Which friend do you want to destroy first? 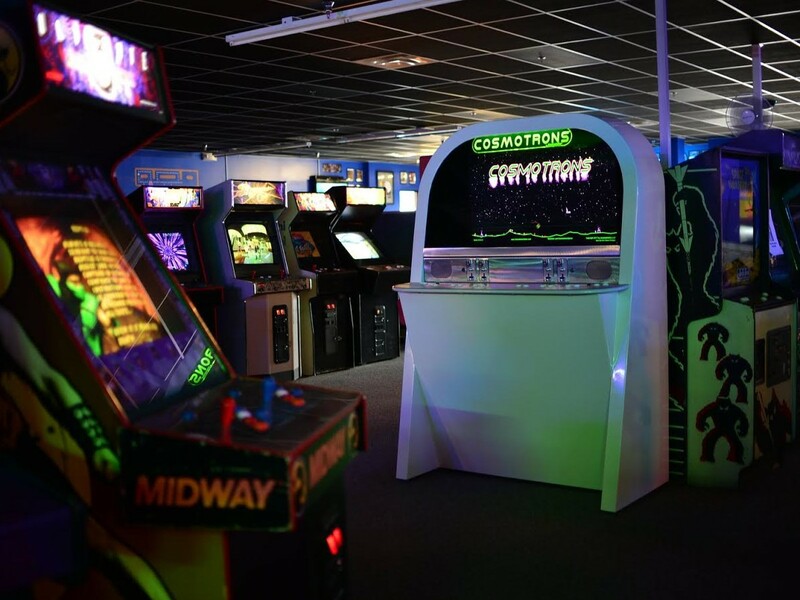 Recruits are needed to join the battle now at an arcade near you! 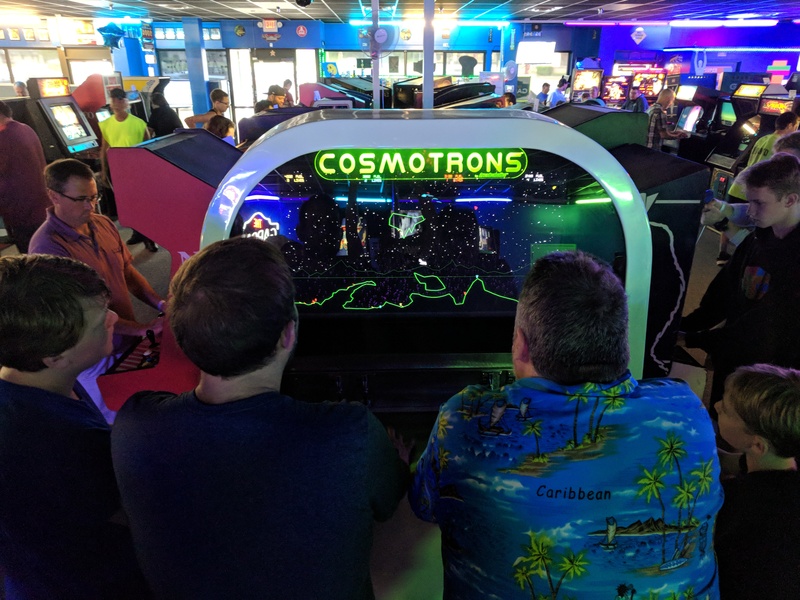 Cosmotrons and the Delux-o-Tron arcade cabinet are designed for making players yell, celebrate, and experience multiplayer memories! Up to four pilots battle at a time against each other, and gravity, through dangerous territories! 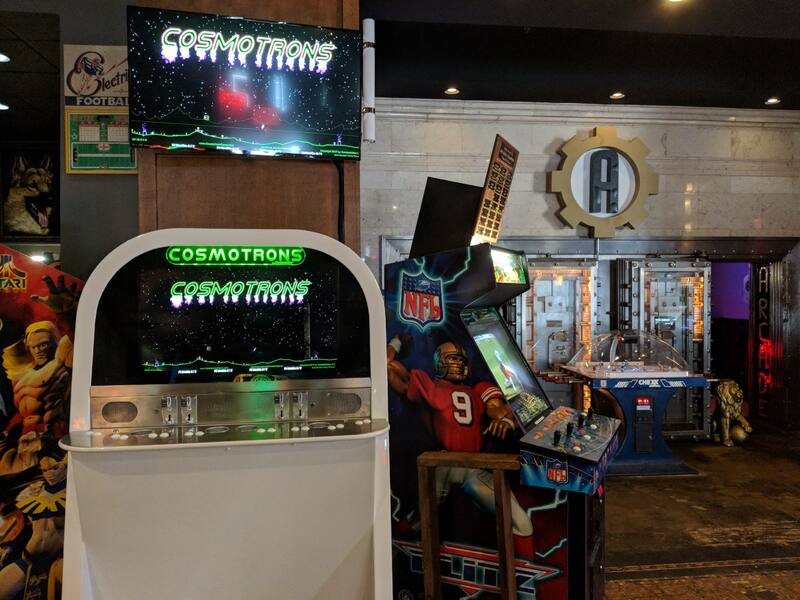 Cosmotrons video arcade machines can be purchased for your location! 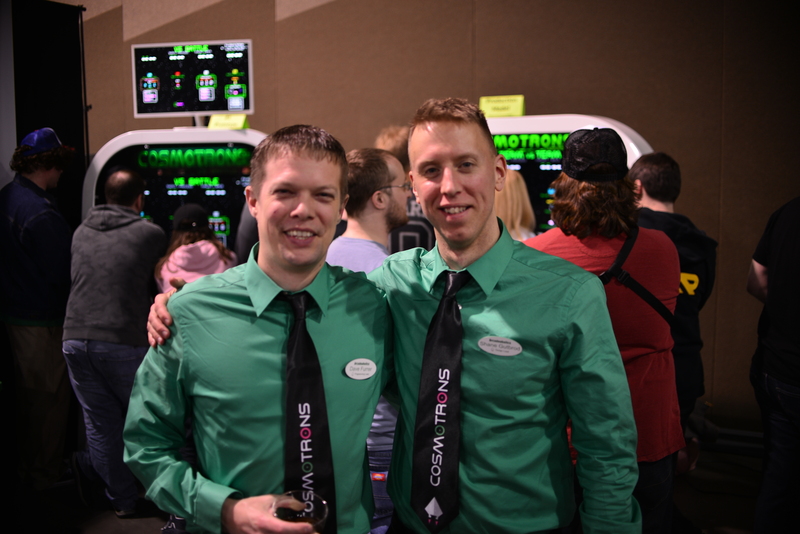 Cosmotrons has been shown to bring customers in, keep them in, increase beverage sales, and have strong earnings, especially when considering its small footprint. 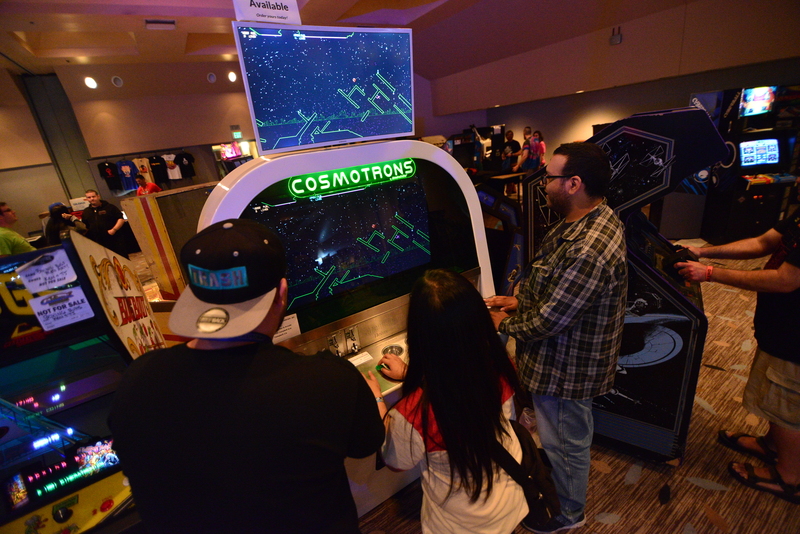 Cosmotrons has been designed to keep players coming back for more due to its depth and high replayability. 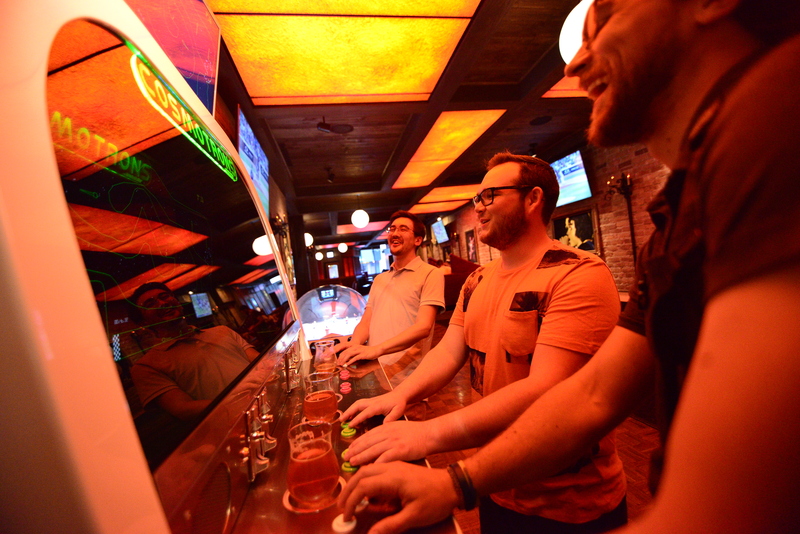 Numerous options are available to suit location needs and budgets. 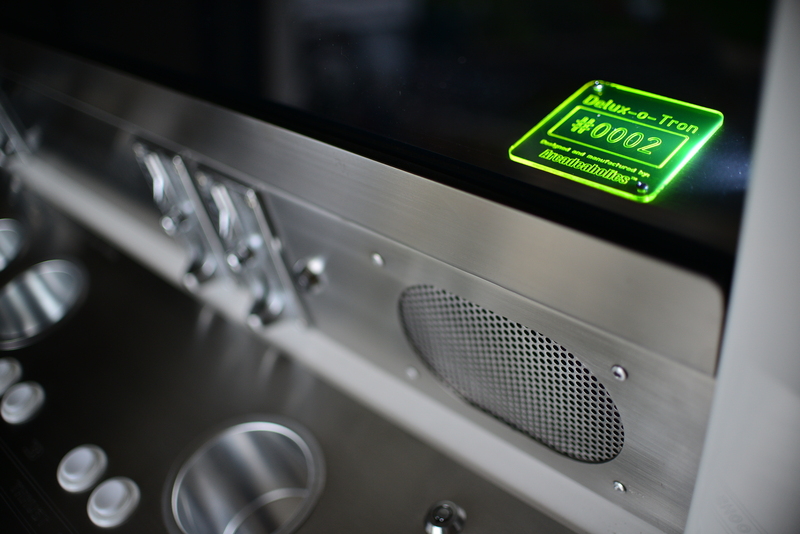 The most popular options are control panel mounted beverage holders and the spectator screen package. 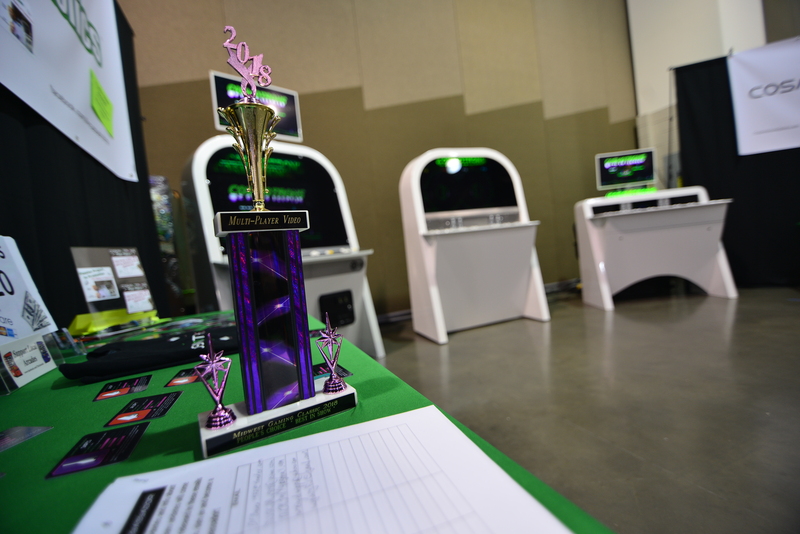 Contact us to help you determine what model and options are best for you! 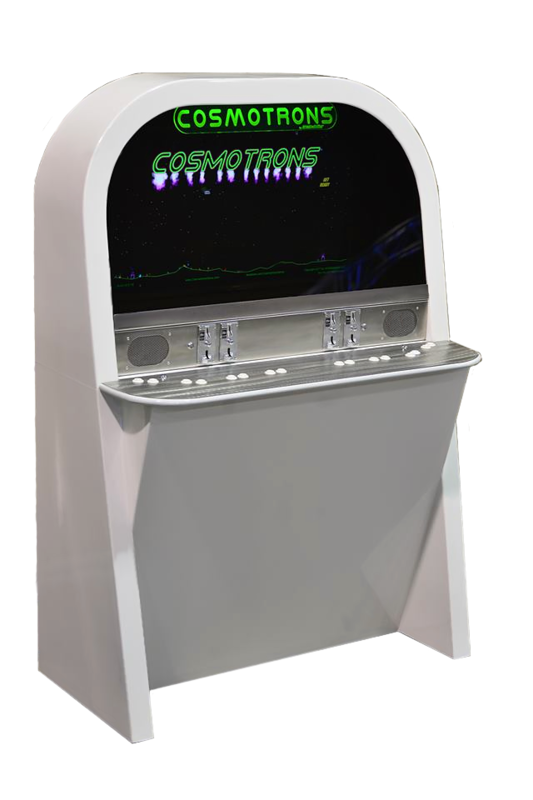 Cosmotrons has been designed and developed in Wisconsin, USA by Arcadeaholics LLC. Every pilot for themselves! Be the last surviving pilot at the end of a chaotic battle to gain the territory. Two teams battle against each other to control territories either by destroying their opponents or completing the objective of raising their flag. 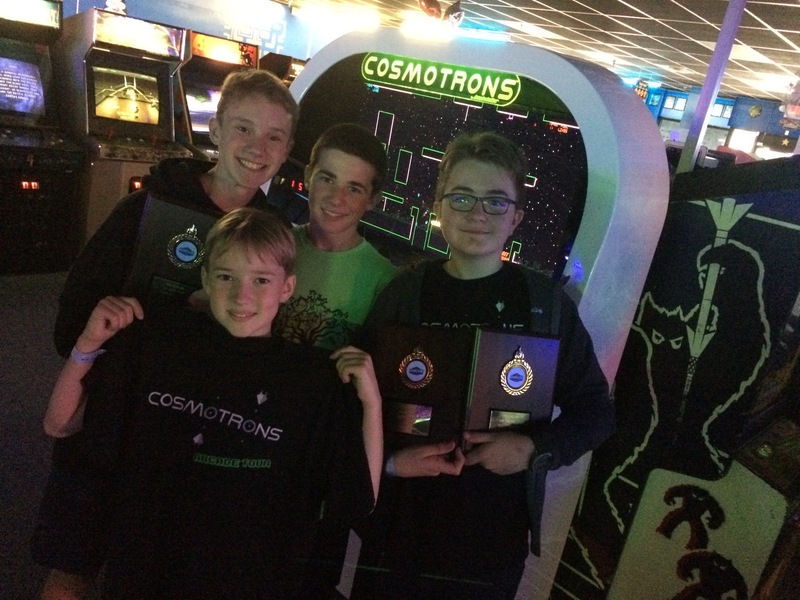 In Team Mode partners share lives and fuel. This is like a boss battle but one pilot gets to be the boss! One pilot controls the overpowered Juggernaut ship and the other players team up in an attempt to destroy them. In single player mode space pilots can explore territories, practice flight and shooting skills, and participate in timed speed runs. There are 20+ dangerous territories for you to explore and battle in including lunar surfaces, underground alien structures, active volcanic hot spots, caverns with falling stalactites, and more. Gravity is just as dangerous as your enemies as it always tries to pull you towards impending doom, on some terrains not always in the same direction. Skillful piloting is necessary to survive. Piloting of your spaceship requires fuel. Either defeat all your enemies in a territory before your fuel depletes or choose to find and collect fuel resources throughout the territories during battle. But be careful, collecting fuel resources is dangerous and often leaves you vulnerable! 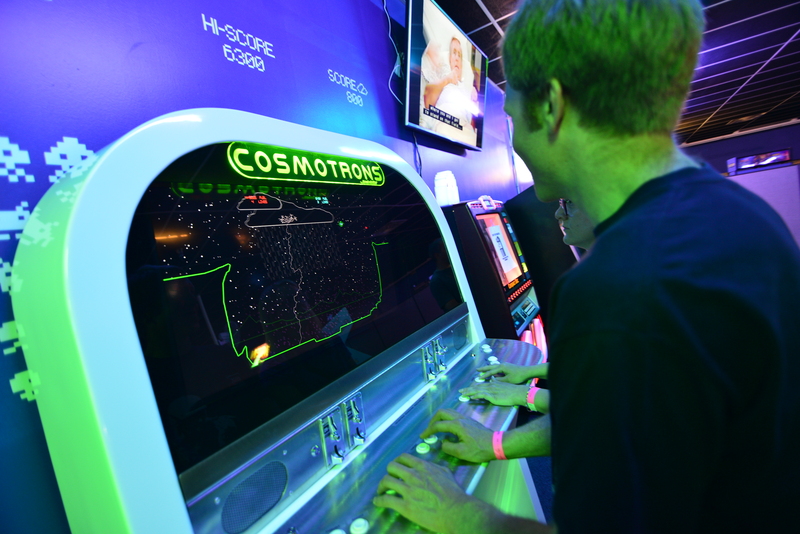 In Cosmotrons, the piloting of your spaceship itself is fun and very rewarding. Control is tight, allowing for trick aerial maneuvers and pixel perfect ship placement in dangerous areas. Planning ahead of where you want your spaceship to go is necessary as you account for gravity and inertia. 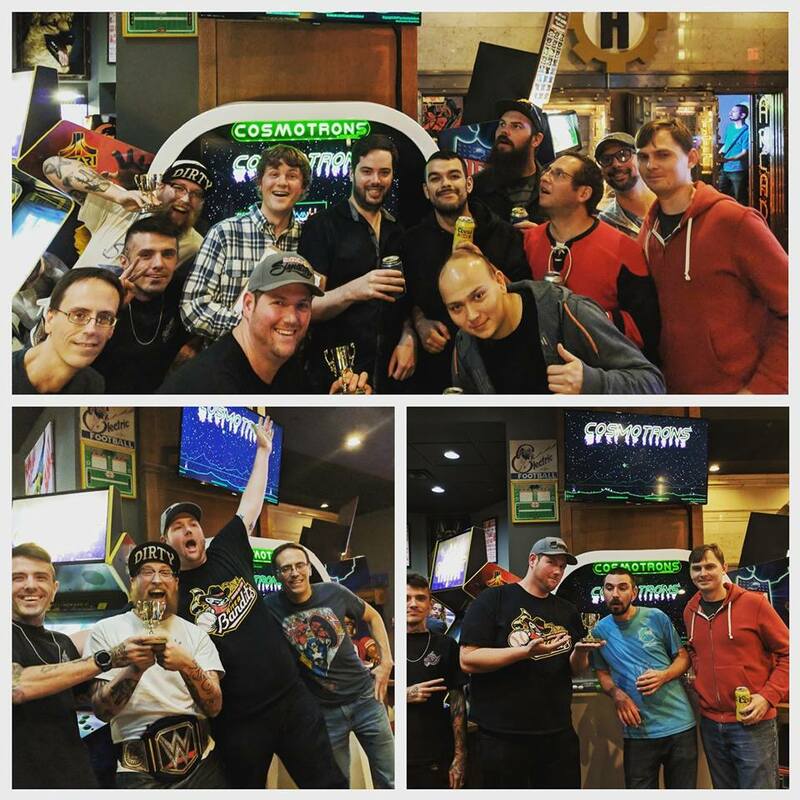 Get out there and join the battle! Don’t let gravity bring you down!